After Kerry Campaign. 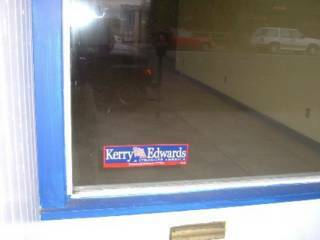 Empty campaign office on State Street in Bellingham. Since Kerry and Bush had similar stands on national defense, maybe that should have not been the focus of the campaign. The subtle differences were hard for people to grasp. If the campaign had focused on domestic issues, there could have been more substance to Kerry's difference, from Bush, for people to grasp. Do Democrats have a "big picture" vision ? America 50 years from now. Still coasting on Roosevelt's "New Deal" of the 1930s and Johnson's "Great Society" of the 1960s new issues, like gay marriage keep getting tacked on. That old vision with all these new things tacked on reads like a laundry list of "me too" special interests. Labor, women, gays, nimbies, and eventually middle class tax cuts. Can this bag of promises all hold together? Like many things, gay marriage is more than just another goody to pull out of the bag. It fits into a broader issue of changing family patterns. This relates to world population growth and eventually the environment. The leg bone connected to the hip bone. I am remembering a "white paper" that came out in the 1970s from some think tank called "The World Watch Institute." They produced a report on feminism and related changes that are leading to things like smaller families. More single people and, most importantly, "slowing population growth." Gay marriage can be seen in a larger context. It relates to changing attitudes about sexuality and family. Moving away from procreation toward more diversity of experience. This relates to things like immigration reform and the 4 thousand illegal aliens I hear about crossing our border with Mexico each day. Nations with high birth rates. This relates to water shortages in the American southwest. What about the depletion of the Ogalla aquifer? Also relates to traffic, sprawl, and the need for urban in filling. All these issues relate to a world that is getting more crowded and consuming more resources. A vision for how America, and the world, shall survive in the next 50 years and beyond is paramount. All these pieces can find niches in the greater whole. It isn't just gay marriage here and protecting a wetland there. It isn't just a bag of unrelated promises tacked onto an outdated great society image from the 1960s. Also it is important to maintain a sense of progress. The future must offer us more than just sacrificing for survival's sake. If reducing consumption is necessary, how about envisioning a 3 day weekend? Hurry, a 3 day weekend. A 32 hour work week. Less money to consume with, but more time for family, friends and community involvement. How about a cultural revival. If people felt they could be better off, in a broader sense, than just materialistically, they might go for it. This relates to the concept of more choices. More freedom. Also relates to healthier lifestyles. How about more time for exercise? Lower health care costs nation wide, improving access and insurance affordability. Connect the dots. All these things can find a place in the vision. So far, I am just talking about a vision of interrelated concepts, not necessarily legislation. Some would still call this social engineering. Others might call it an agenda. "The gay agenda?" Problem is, there really hasn't been a gay agenda. Gay people can be just as materialistic and workaholic as anyone else. Democrats need to at least start dreaming again. Where will America, and the world be in 50, 100 years? The national leadership could better connect itself with grass roots level organizations that are promoting these things for a sustainable economy. Reducing healthcare costs for improving access. Un Manned Space exploration, Astronomy. Letting free enterprise direct manned space flight; tourism. These things may not "play in Peoria" for the short run, but an election is not right around the corner. If Democrats are looking for a long term vision, they could start connecting the dots that these grass roots innovations have developed. It may take convincing the majority of Americans to think in new ways beyond just "who provides a tax rebate?" Making the case for a sustainable economy is a bit different than just trying to win the next election. There may be time to develop this vision before the next election. People might buy it if it looks like the road to a brighter future. Why say the Democrats need a better plan? The Republicans certainly need a better plan. Media talks about the Democrats looking for a focus. Republicans seem less open to a new focus. Supposedly Republicans already have a focus that works, but it is running us into the ground. Actually Republican's face a lot of internal contradictions as well.